Ships tomorrow if you order in the next 20 hours 20 minutes. Auto Ship & Earn + 139 Points What's this? Busy lifestyles don't leave much time for proper, healthy meals. While you have a number of options for snacks and food while on the go, why not reach for a healthier choice? 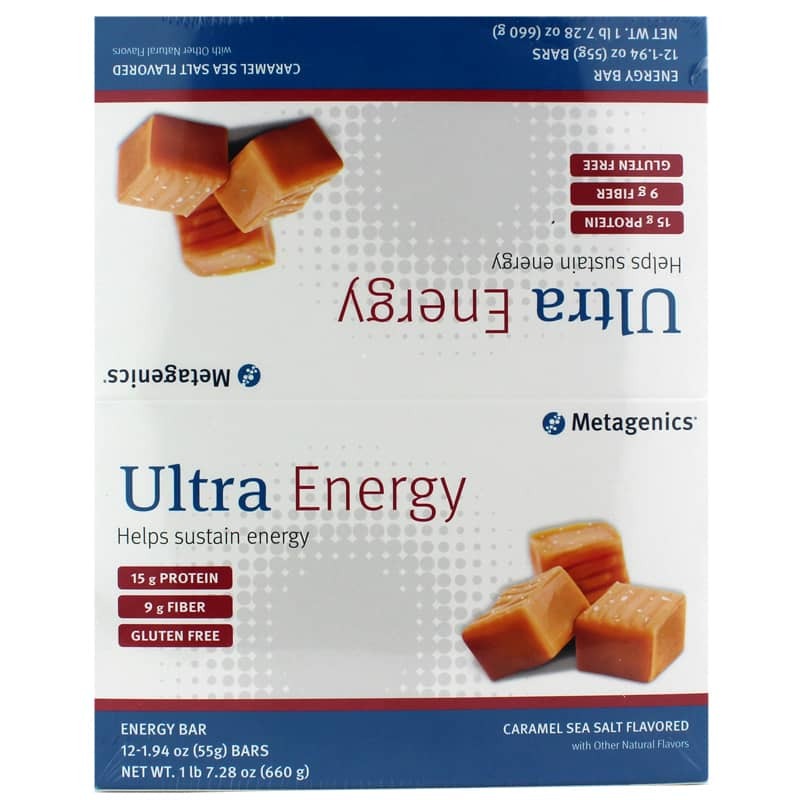 Metagenics offers the Caramel Sea Salt Ultra Energy Bar, an energy-sustaining super snack that you'll love. Don't let low energy levels slow you down during the day. Keep a Caramel Sea Salt Ultra Energy Bar in your bag for when you really need it. Give them a try today for a healthier and delicious way to sustained energy so you can keep going all day long. Order yours now! 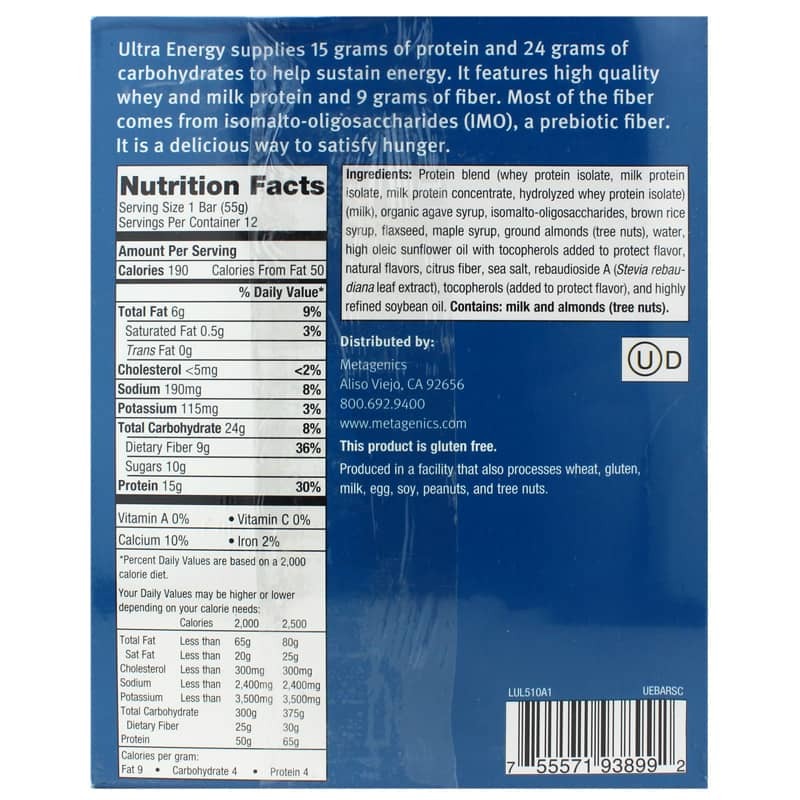 Ingredients: Protein blend (whey protein isolate, milk protein isolate, milk protein concentrate, hydrolyzed whey protein isolate) (milk), organic agave syrup, isomalto-oligosaccharides, brown rice syrup, flaxseed, maple syrup, ground almonds (tree nuts), water, high oleic sunflower oil with tocopherols added to protect flavor, natural flavors, citrus fiber, sea salt, rebaudioside A (Stevia rebaudiana leaf extract), tocopherols (added to protect flavor), and highly refined soybean oil. Contains: milk and almonds (tree nuts). Produced in a facility that also processes wheat, gluten, milk, egg, soy, peanuts, and tree nuts. great service & prompt delivery!